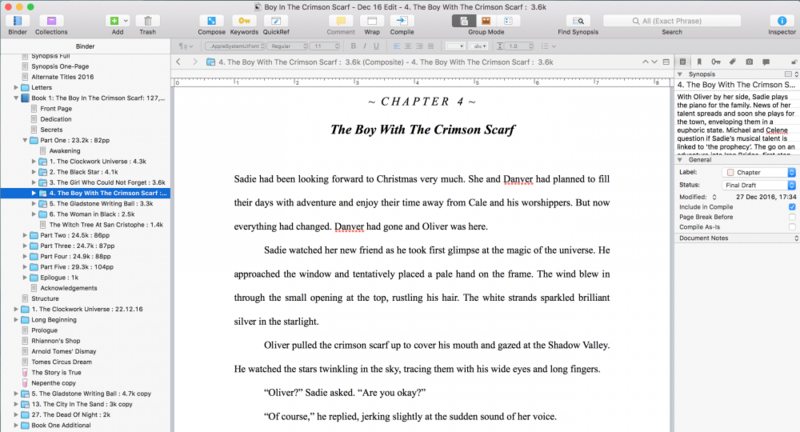 Formats for Desktop/Tablet, Mobile Devices and Amazon Kindle. If you’re veiwing this page in the Facebook or Twitter App these links may not work correctly. Open this page in your browser of choice and get reading! Or you can simply scroll down to read the story right now. I am currently seeking agency representation for The Madison Chronicles. If you’re interested in reading more of this book then please get in touch. I’d appreciate the feedback. I’ll be posting two more extract soon: The Woman Who Labelled Everything (a tale of obsession) and The Princess in the Threadbare Gown (a tragedy). Check back soon or like my Facebook Page or follow me on Twitter for updates. Now, get comfy and enjoy! Thanks for reading. 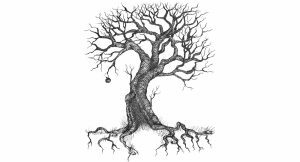 It was nigh on two thousand years ago that the legend of The Witch Tree began. To hear it, we must travel a great distance, through time and space. Over the River Myr we must fly, leaving the safety of Iron Bridge behind. We must skim the western treetops of Darachna Forest, then up and over the Black Mountains. The sharp stone and rock of the mountains spreads out beneath us for hundreds of miles with holdfasts and crumbling castles perched on cliff tops and rooted in valleys. Beyond the mountains we fly, across the Snake Plains, towards the distant Western Waters. 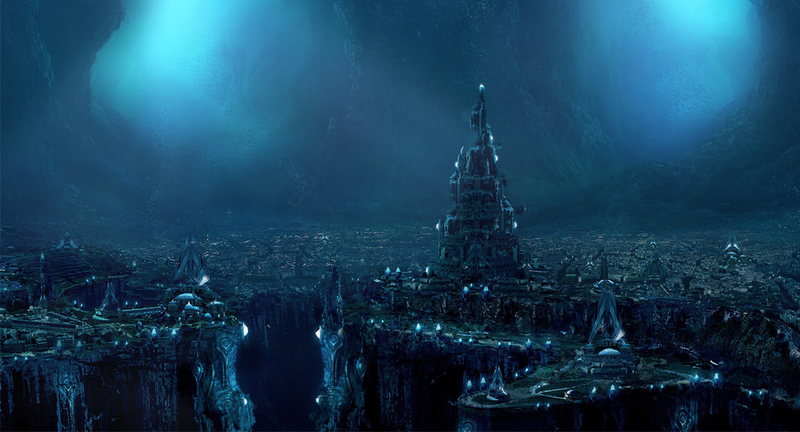 And here, at the very edge of the world, lies the mighty circular cities of San Cristophe. Somewhere in the swirling sand and withering heat, outside the walls of San Cristophe, stood three Sisters: dressed in black, bound in iron. The first, no older than sixteen, shielded her vivid blue eyes from the sun and sand. The second grunted listlessly, digging her work-worn hands into her wide hips. 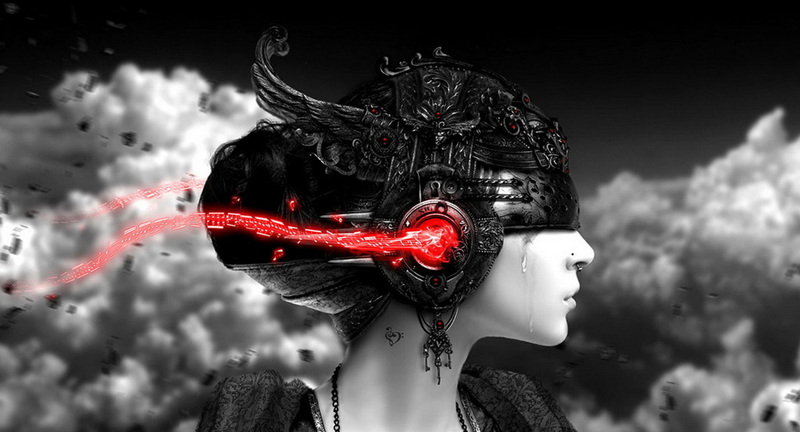 The third raised her gnarled head towards the battlements, muttering incantations and the ancient Words of Shadow. Now, they weren’t sisters in the way you and I think of sisters, for they were not of the same mother, but they were of another, more terrible, Sisterhood: the Sisterhood of Witches. The King looked down on the three women draped in black. From his vantage point, they looked like harmless desert beetles; beetles that he could crush beneath the heel of his boot. But they were far from harmless and, even at this distance, he did not feel the least bit safe. The old witch, hearing the words of the King, spat on the ground in disgust. Her spittle sizzled, smoked, then spawned hundreds of black scorpions that wriggled and fought and melted into a steaming tar at her feet. The King turned to his advisors, clerics and men-at-arms. Their faces were white with fear. The Kings’ Archdeacon strode forward and demanded that the witches be banished from the city, cursed never to return, but the King silenced him with a hand and commanded that the witches be put to death. The Kings’ Golden Warriors took the three witches one thousand paces south of the city and ended their mortal lives. They dug a communal grave by the side of the Kingsroad and placed them side-by-side in the ground. Their bodies were then burned in camphor oil, the bones covered in soil and sand and salt. The Archdeacon was brought up to the grave to give a short benediction but no marker, cross or headstone was erected and, after the wind had worked its magic, no trace remained at all. A full moon rose into the sky that night above the city of San Cristophe. It cast a brilliant light across the Snake Plains, turning them into a slithering pale blue sea of dust and sand. The stars seemed diminished, as though they were afraid to show themselves. The King stared across the city, towards the gate where he had condemned the three witches, and said a prayer to the night gods before retiring to bed. But his prayers went unanswered. Across the city, beyond the mighty walls and the Kings Gate, one thousand paces south upon the Snake Plains, beneath the light of the moon, the ground stirred. A shoot sprang from the desiccated earth; a black shoot that writhed and flicked like an earthworm. Within minutes the shoot broke into two, and then four, and then eight, and stretched up towards the sky, growing and building and spreading until it became a small tree with twisted branches and gnarled bark, black as night. The tree grew until it was more than thirty feet high, swaying gently in the night air. The King was alerted by the cries of his advisors. He, accompanied by his Golden Warriors, advisors, clerics and men-at-arms, was taken, in the dead of night, to the site of the black tree. On seeing the abomination, the King’s face turned paler than a fish’s belly. The tree moved then. The black branches shifted, planting themselves in the ground around the trunk. The Golden Warriors approached tentatively, for the tree had started to groan and creak and wail like an injured beast. They drew their longswords. The blades glistened, razor-sharp, but every time they approached, the branches lashed out, knocking the Golden Warriors across the sand. Again and again they attacked, but the tree pushed them away with a sense of mild indifference. The King, growing tired of the efforts of his Golden Warriors, took up his Moonblade Axe and approached the Witch Tree. To his surprise, the branches retracted from the sand and let the King pass beneath. It was only once he was stood next to the huge blackened trunk, his axe arcing through the air, did the branches reach down and seized the King. He went reeling into the air, screaming and yelping as the branches tightened around his waist like the coils of a deadly serpent. The tree pulled the King close. The faces of the three witches appeared before him in the burnt bark, knotted and angry. They watched him thoughtfully for a moment, as he squirmed in pain, before laughing darkly. “Even in death, we are more powerful than you can imagine,” said the Mother. “And now it’s time for you to join us,” laughed the Crone, dry and sickly. The King was suspended above the tree, a branch around each limb. A fifth branch swirled overhead, moving viscously from side to side. It whipped forward, coiling itself around the King’s neck, killing him stone dead. But that wasn’t the end for the King. His body hung limp and loose in the branches, the witches muttering and chittering inside the bark. A grey cloud of smoke rose from the trunk of the tree, as if it were on fire. The smoke crackled and fizzed, arrows of blue and white light shot into the night, sparks dropping to the sand like dying fireflies. 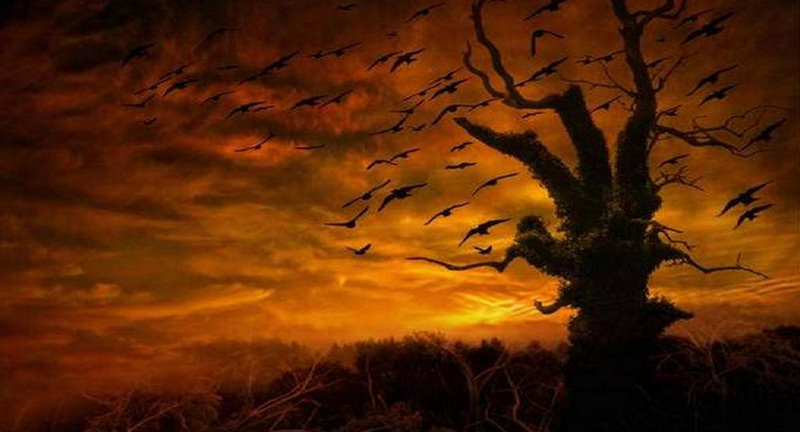 The King’s soul was ripped from his body, smothered in smoke, and dragged down into the tree. As the smoke vanished, the King’s body landed cruelly on the sand. The Archdeacon moved forward to help his King, but there was nothing he could do. As he sat there weeping, he could have sworn that he heard his King’s smothered voice, wailing in the distance. He turned and looked at the tree, and there, in the bark was the grinning face of the three witches. But, most horrible of all, between their wretched faces was that of the King, etched in the black bark of the Witch Tree. His eyes were terrified, wide and screaming. He opened his mouth to call out but thirty long, wicked fingers reached over his face and dragged him deep into the roots of the tree. Following the King’s death, a sandstone tower was built around the tree and engulfed by the expanding city. It is now guarded by descendants of the Golden Warriors. Its true location is an ancient mystery. 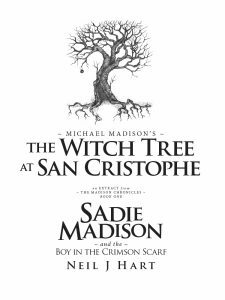 But, they say, if you’re able to find the Witch Tree at San Cristophe, and you’re able to get close enough, you can hear the screams of the King from inside, begging for forgiveness. 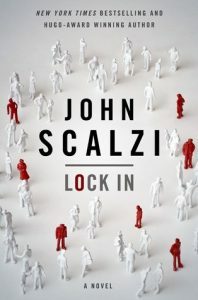 John Scalzi’s gripping novel ‘Lock-In‘ is set in near-future Washington DC after a deadly virus has attacked the planet and rendered many with Haden’s Syndrome: the affliction of being locked inside your own mind. Technological advances allow those afflicted, known as Haden’s, to control Threeps (robotic psychical replacements) from their beds in an attempt to lead normal lives. Lock-In is fast-paced, political, and filled with great sci-fi concepts that don’t seem that far out of reach. I’ve also read Ransom Riggs’s ‘Hollow City‘ a light-weight sequel to the excellent ‘Miss Peregrine’s Home For Peculiar Children‘; ‘The Outsider‘ by Albert Camus, about a man discovering his true psychotic nature; and J.K.Rowlings’s ‘Harry Potter and the Goblet of Fire‘.